Kirsten Wells is a GLL Sport Foundation supported athlete that competes in Ultimate Frisbee. She has sent us an update on her latest achievement. 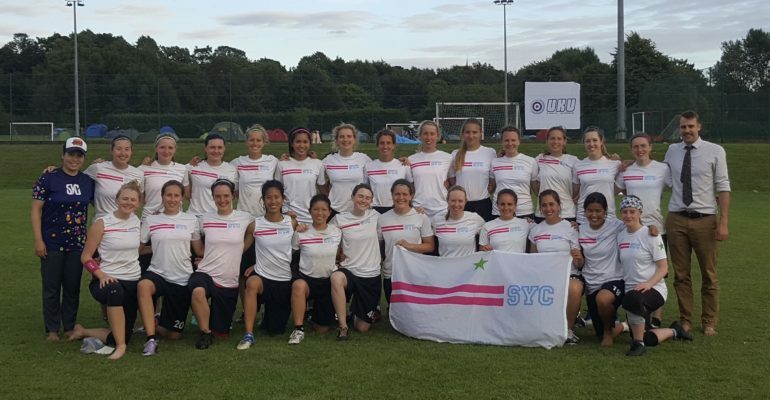 It was UK Ultimate Nationals over the Bank Holiday Weekend and I’m super excited to tell you that SYC finished 2nd out of 8 women’s teams, meaning we automatically qualify for the European Championships at the end of September in Italy! It was the first time in 3 years that SYC have made the final of Nationals. The weekend was the pinnacle of the season for us – something that we have been building for since way back in the winter during the off season. Countless gym, cardio and team training sessions have gone into that weekend and it was genuinely such a team effort, and one that I think we will be very proud of for some time to come. We had some tough pool games on the Saturday, culminating in wins against Reading and Iceni (winner of Nationals for the past 6 years!) We had an unfortunate loss to Irish team Rebel, which lined up a semi final on Sunday against Bristol, a team that has beaten us twice this season. For me, my favourite part of the weekend was the semi final. We all played so brilliantly, with complete confidence and trust in our teammates against some really tough opposition from Bristol, (who should be equally proud of their play during that game!) Our victory created a rematch against Iceni in the final, and vengeance was theirs as they beat us 15-6 in the final to automatically qualify for Euros and also World Championships next year. I’m so phenomenally proud of my team. The depths of squads at Nationals proved how strong the women’s division is becoming in the UK, which is really exciting for our sport. We have proved that we have mental toughness to overcome some stiff competition from other top teams in the country, and I certainly am looking forward to what it is in store for us at Europeans. We are waiting to hear if there will be another bid for a UK women’s team to go to the World Club Championships in Cincinnati next year, so we are crossing our fingers we will get to attend that! Again, a big thank you for the support across this year. For me, it means so much that I can access some amazing facilities and have all the tools I need for strength and conditioning. I’m incredibly proud to be a GLL athlete and it has made such a difference to my season so far this year.